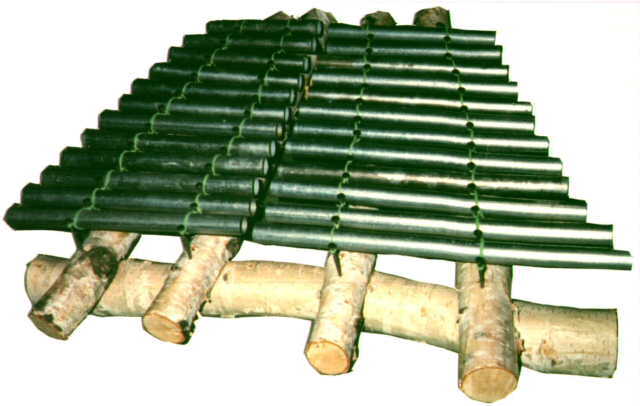 Build a conduit-tubing hammered dulcimer. NOTE: 12 additional photos and a sound sample of this instrument are available. Click here for information. conventional instrument, playing in the keys of D, G and C.
twisty, so long as they are reasonably straight in one plane. Cut one of the thicker logs to about 15", the other to about 22". another across the right side. Position their centerlines 15 1/2"
surface so that the instrument will not rock. In like manner notch & secure the remaining two thinner logs. Distance "a" (centerline to centerline) = 4 1/2"
"     "b"     "        "     "       = 6"
"     "c"     "        "     "       = 5"
straight, use pliers afterwards to straighten. 13 "courses". 54 nails in all should be installed. 5 1/4"   D - --- G  7 13/64"
6 1/32"  C -- ---- F  7 1/2"
6 1/4"   B --- ----- E  7 53/64"
6 11/16" A ---- ------ D  8 1/4"
7 13/64" G ----- ------- C  8 13/16"
7 5/16" F# ------ -------- B  9 1/16"
7 53/64" E ------- --------- A  9 5/8"
8 1/4"   D -------- ---------- G  10 9/64"
8 5/8"  C# --------- ----------- F# 10 1/2"
9 1/32"  B ---------- ------------ E  11 1/8"
9 5/8"   A ----------- ------------- D  11 45/64"
9 59/64"G# ------------ -------------- C# 12 3/32"
TUBES FIRST -- THAT WAY YOU CAN STILL UTILIZE ANY "TOO-SHORT"
TUBES FOR A HIGHER NOTE. section) seem to dampen vibration least. sets) to act as a "testing cradle" to use while pitching a pipe. much more than when whacked with a regular dulcimer-hammer.